papers available are harder to find and more expensive. napkins in your party colors to make party poms from. These packs of napkins in a dark puple came from Dollar Tree. 30 napkins per pack in the cocktail size napkins for (duh) $1. 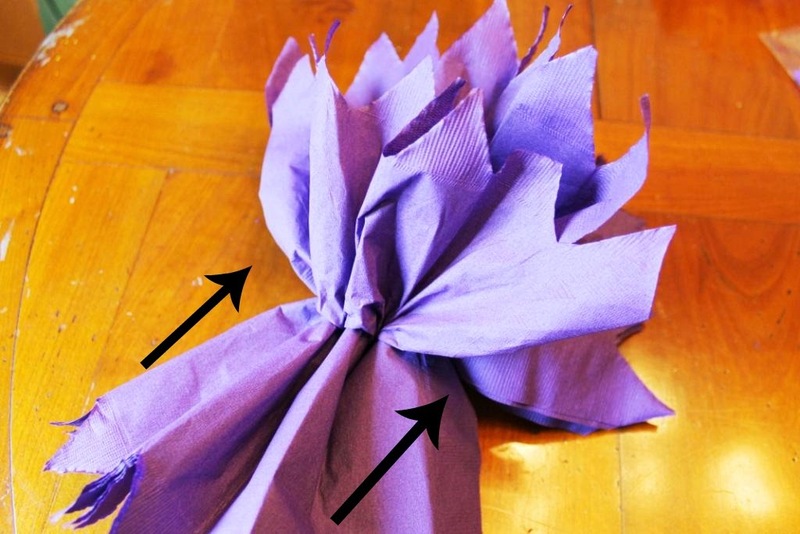 can make 2-3 poms per pack of napkins, or just pennies! 7-10 napkins on top of each other. Line up the edges. Fold down about 1 inch along the top edge. and as even as possible. with a chenille stem, narrow ribbon, twisty tie, etc. the pom look more fun. You can cut in points or rounded. On both sides of the center, separate the top napkin from the other layers and gently pull it towards the center. layers gently close to the folds and not the edge. as much toward the center...it gets easier. This pom had 7 layers so it formed more of a half-ball shape. cut into a rounded shape. have a little more fullness. be able to pull and fluff the layers at the center point. Each of these poms cost only 33 pennies! That is a lot less than you can find them anywhere else. to back) that would only be 66 pennies. and the cocktail napkin pom (rounded ends) is about 8" across. They have a velvet-y look and deep rich color. (when I can even find them). Wow, I love the deep intensity of your color choice! Magical! I love how the napkins look as pom poms but the rounded corner ones take on a look of beautiful hydrangeas! Imagine the possibilities will alternating colors of napkins! Your ideas and projects are always so awesome! Cheers! How pretty and what a clever idea. Who can beat it for a buck. So glad you shared your inspiration with us! With graduations coming up and how costly they are, these are a great addition to any party. Thanks for joining in. So so cute, and such a party decoration and at such a price. Well, I wish I had been that clever when I was at the $Store the other day looking for pretty colored tissue paper to make some pompoms. I settled on some paper that isn't exactly what I wanted, but now I know I don't have to settle! Great idea! They turned out so pretty, love the color. 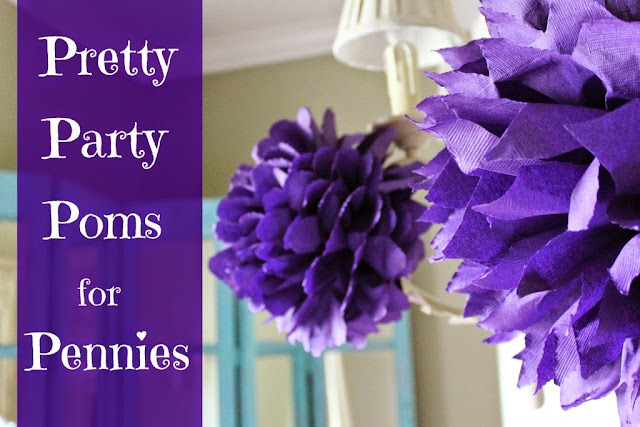 Hello Miss Kitty, what a great tutorial to make these fun party poms, and inexpensive! I think this is a great idea for all the patriotic holidays coming up. Thanks for sharing and hope your week is off to a good start. Oh, my lil girl would love to make these.....and for that price I could keep her busy all day! Thanks so much for sharing! Following from Coastal Charms tuesday linkup! Perfect idea for those napkins. Your pom poms turned out great! I recently spent a fortune on pom kits for my husband's "milestone" birthday party. They still required quite a bit of time to construct and weren't even as cute as these! My tween daughter saw these and has requested that we make these (in the same color you chose) as a project to do together this summer. Thanks! I really like this idea! It also makes them so much studier if you are going to use them outside. They look gorgeous! Oh my..I love it...I never thought to make pom poms out of napkins...what a fantastic idea...thanks for the tutorial...so easy to follow!!! I wanted to tell you thank you for visiting my post about the North Pole Park in Denver. I also wanted to let you know it is at the base of Pikes Peak very close to Garden of the Gods. Have a great day.